Urawa Akenohoshi Girls’ Junior and Senior High School, was founded by The Sisters of the Assumption of the Blessed Virgin, of Quebec, Canada in 1967 with a mere 10 students. From the start it was dedicated to offering a high standard of education for girls. The school is now overseen by a religious group of nuns called Akenohshi Gakuen and educates some 1,000 students, from kindergarten (boys and girls) and girls only to high school graduation. From its humble beginnings, it has grown in its 50 years of existence to become one of the most highly regarded schools in the country, with excellent facilities and a reputation for high academic achievement in a caring tradition based in Christianity. 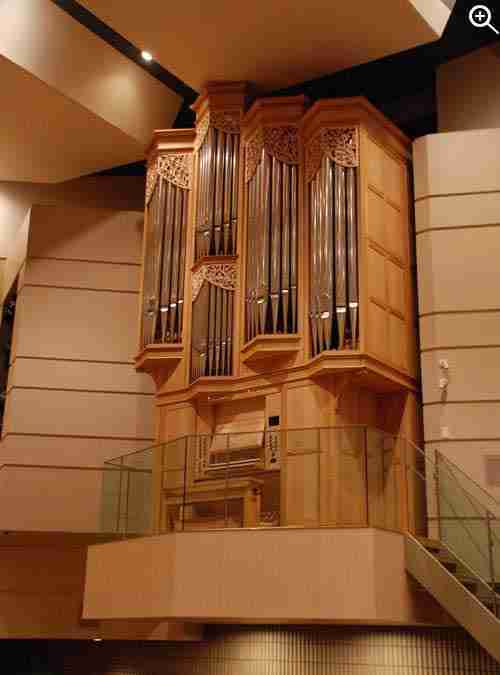 Some 30 years ago, the school built a large auditorium, but as is so often the case, no provision was made at the time for a pipe organ. 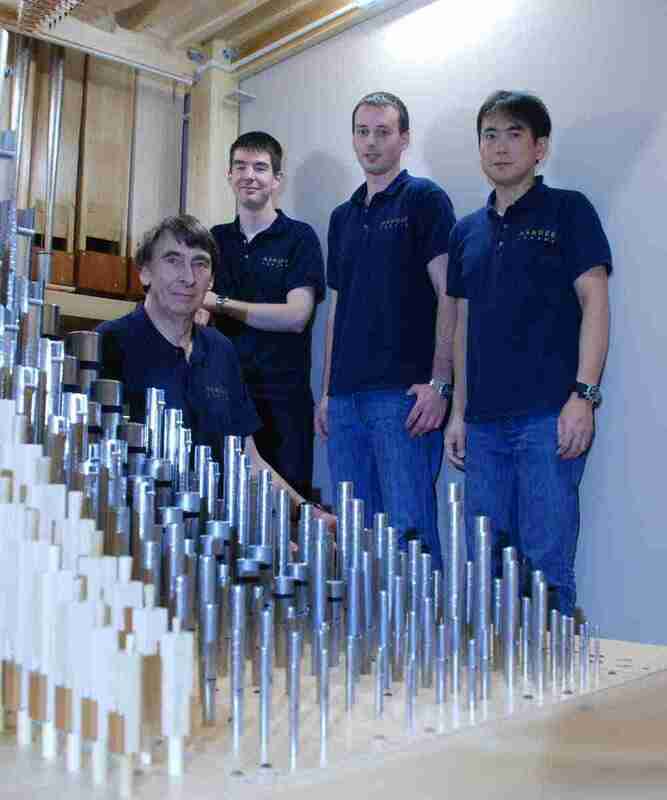 When the school first approached us about a new organ, finding somewhere to put an instrument presented us with something of a problem. The stage was not an option as that was needed for all sorts of events which take place in the auditorium. The school engaged the services of an architect and what at first seemed like an unlikely solution, a new gallery on the right-hand side of the auditorium was proposed, one which the architect then realised with an elegant design which matched the architecture of the room to the point where one could hardly imagine it came as an afterthought. Various case designs were proposed, some classical, others more contemporary, some symmetrical and others asymmetrical. Ultimately, an asymmetrical and contemporary design was settled on, which we would like to think complements the design of the hall and gives the impression it has always been there. 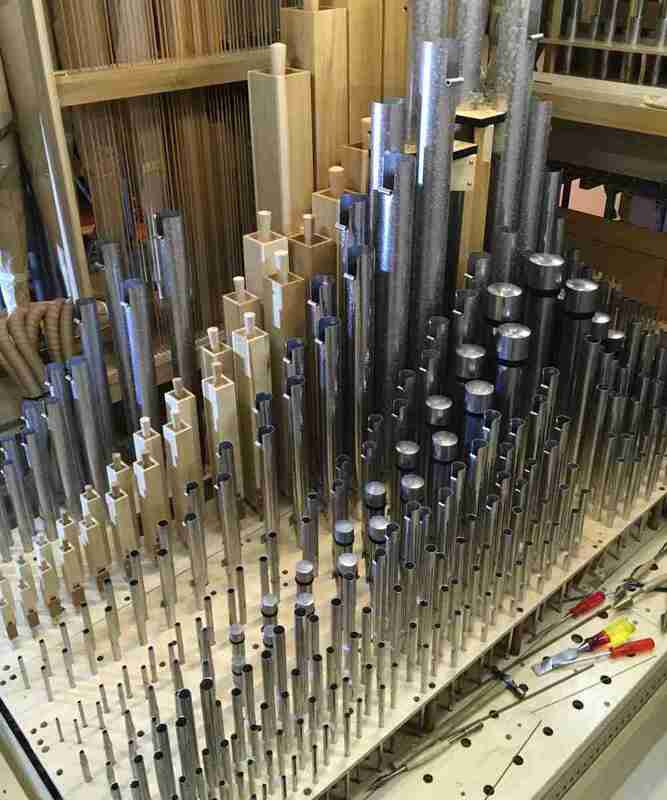 Whilst the school has a thriving music department, the playing of the organ has not been a feature of the curriculum thus far, but this is set to change as the organ has been conceived to afford potential organ students a flexible and versatile instrument to inspire them to explore the rich organ repertoire. The instrument has two manuals and pedals with 21 stops, employing mechanical key and pedal actions with electric drawstop action. Organs in Japan are usually afforded a degree of protection from earthquakes. Ultimately, in the event of a serious earthquake, it is all but impossible to bensure total protection. 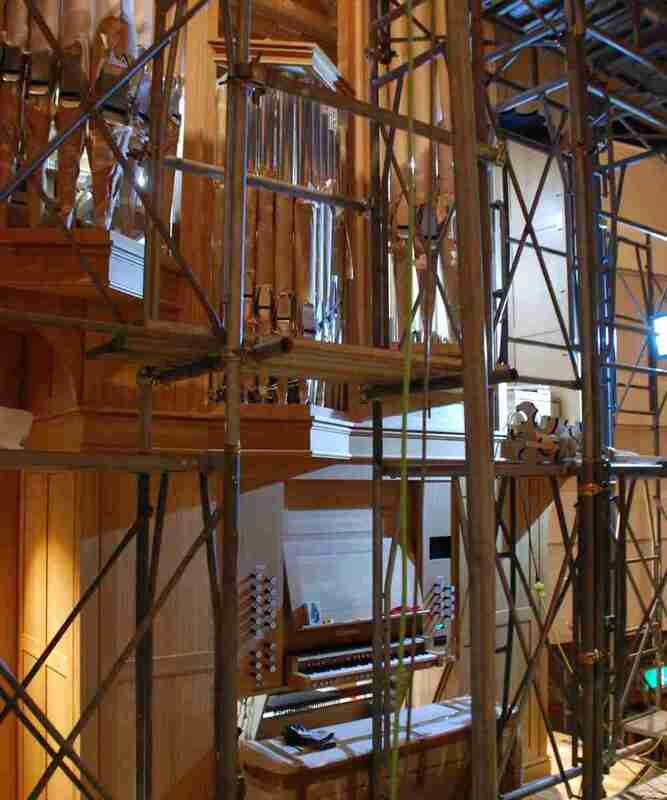 However, some protection has been made by suspending the larger front pipes from above and adding ties for the smaller front pipes, so that (one hopes) none of the façade pipes will fall out of the case in the event of an earthquake. In addition, the top of the case is tied back to the wall, the building frame of more sturdy than usual construction is tied back into the wall and the ground frame is bolted to the floor. The Specification of the Urawa Akenohoshi Girls’ School's organ and the pipe scales. 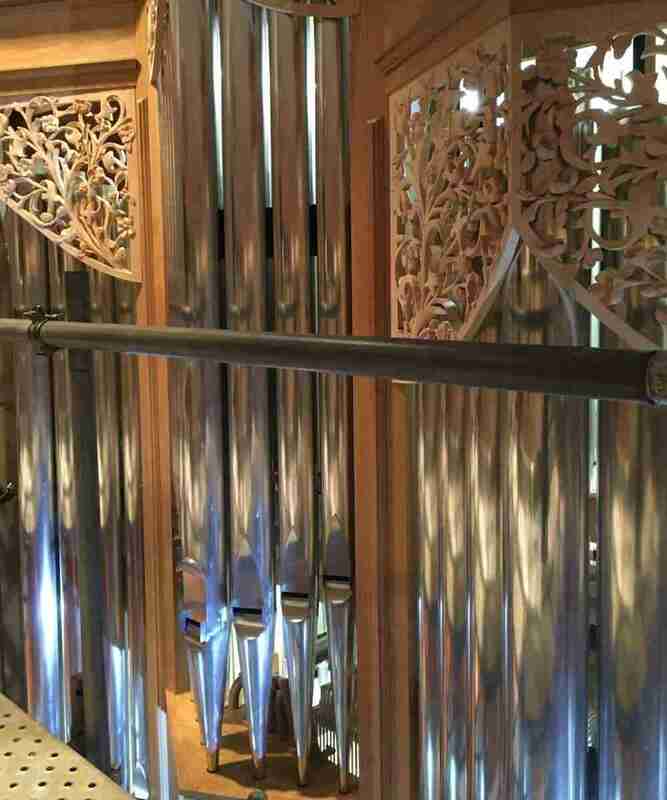 The organ was completed in December 2017.